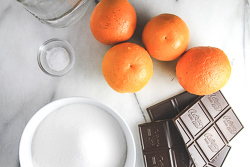 A classic pairing around the holidays, orange and dark chocolate are delicious together! We will never look at an orange peel in quite the same way. 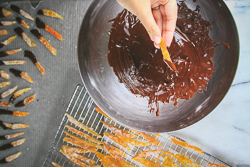 It’s a simple process, just be sure to allow 1-2 days of “hands-off” drying time for the candied orange peels to dry into the perfect chewy consistency before dipping them into the dark chocolate. 1. Place a cooling rack over a parchment-lined sheet pan. 2. Slice the oranges into 8 segments and remove the peel. Use a paring knife to remove as much of the white pith as possible. 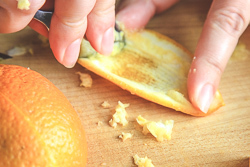 Scrape any remaining pith off of the orange peel using a grapefruit spoon. 3. 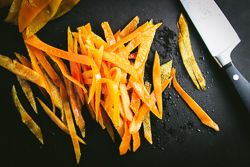 Fill a medium saucepan with 2 cups of the water and 1/4 teaspoon of salt, and boil the orange peels for 15 minutes. Drain, rinse, and drain again. 4. Place the orange peels back into the saucepan. Add 4 cups of water and 2 cups of sugar to the saucepan. 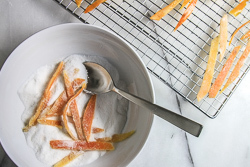 Reheat the orange peels over medium high heat stirring with a silicone spatula until all of the sugar dissolves. 5. Once the syrup boils, reduce the heat and bring the syrup to a simmer. Simmer for 1 hour, continuing to reduce the heat every so often to retain a low, constant simmer. The peel should become very soft and the syrup should reduce and become thick and syrupy. 6. 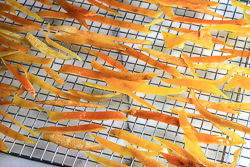 After an hour of simmering, remove the orange peels with tongs and let them cool on the prepared cooling rack for 10 minutes, separating the peels with a spatula before beginning the drying period. 7. 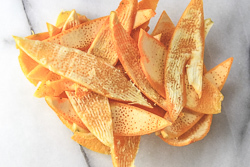 Cut the candied orange peels into even thinner strips. Toss the smaller strips in a bowl with 1 cup of sugar until all the strips are coated. Place the strips back onto the cooling rack and let them dry for 1-2 days. 8. 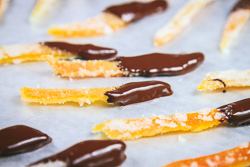 Dip the dried orange peels in melted chocolate. 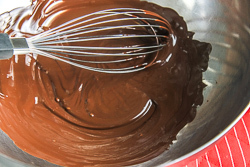 First, temper the chocolate in a double boiler by melting 2/3 of the chocolate and stirring it until it reaches 180 degrees F. Remove the chocolate from heat and add the remaining chocolate pieces, stirring the chocolate gently as it cools to 82 degrees F. Reheat the chocolate to 90 degrees F and dip an end of each orange peel strip into the chocolate. Lay flat to dry on wax paper. 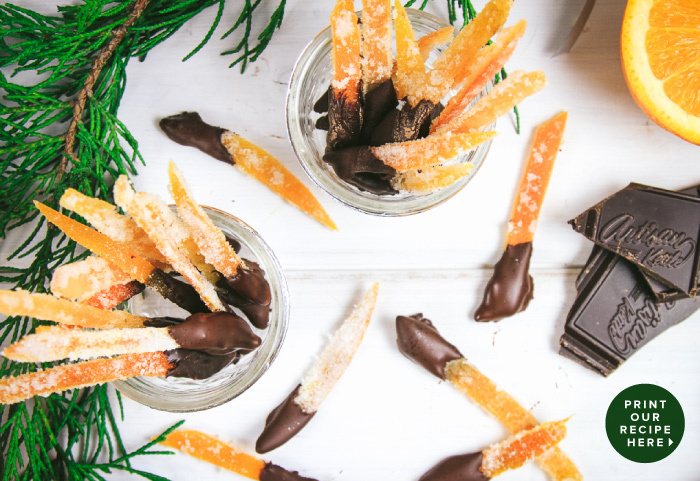 Once the chocolate hardens, the candied orange peel is ready to share and enjoy.